Made from heat stabilized glass filled nylon 6 using injection molding and feature a single aluminum heat shield. 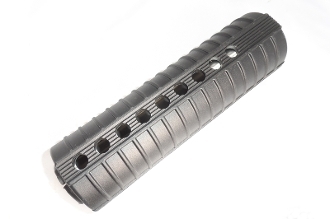 These hand guards are made to fit rifles that use mid-length gas systems. The C6 is made to work with Triangular hand guard caps; triangular is the standard for mid-length. It can function with round handguard caps. "M4 Style" fat hand guards with single heat shields. Made from heat stabilized glass filled nylon 6 using injection molding. Gas Piston: No heatshield in the top, and the handguard is cut to function with most commonly available gas piston systems.